Winter has a serenity that no other season can claim. A stillness and a solitude that appeal mightily to my contemplative side. So when Sally Russick of Studio Sublime announced her Inspired by Winter Blog Challenge, I knew it was for me. 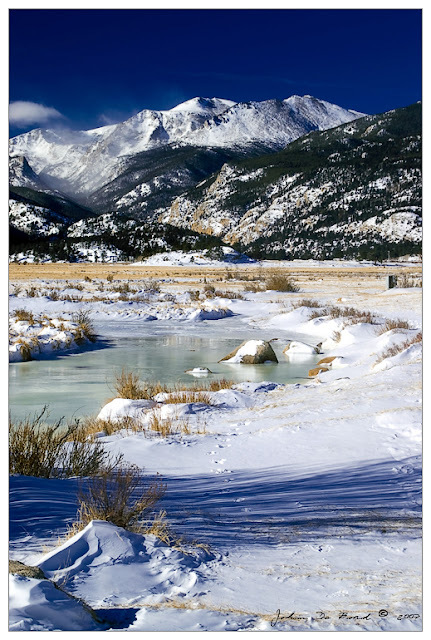 Can’t you just breathe in the crisp air and hear the crunch of snow under your feet when you take in this breathtaking photo, shot in Rocky Mountain National Park by John deBord, and featured on Smashing Magazine’s Winter Wonderland photo layout? DeBord’s photo inspired my Winter Serenity necklace. The photo came with me on my recent trip to San Diego, where I found my focal (a reversible druzy), and a strand of natural matte lapis stones that look like they could have been chipped out of the landscape. 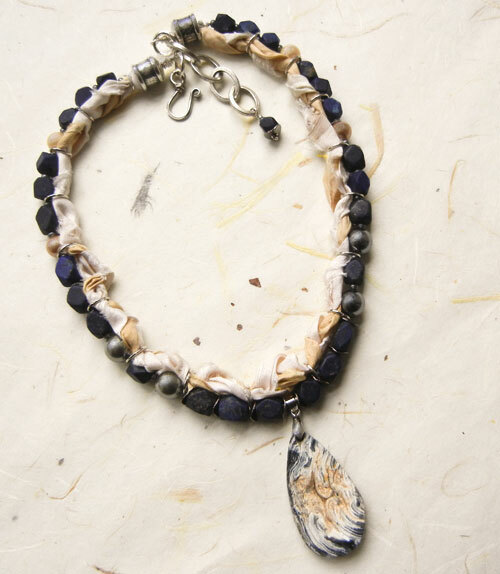 They’re softened by freshwater pearls and braided strands of sari silk, tucked into sterling silver jump rings. This is my first attempt to use fiber in a design, and it’s a technique that caught my eye in Lorelei Eurto and Erin Siegel’s book, Bohemian-Inspired Jewelry. WOW what a stunning piece! and your first time using fiber? bravo! beautifully boho - Erin and Lorelei would be proud :) That focal is really gorgeous - love this piece!! great colors- you really captured that picture! i have stood in that park and felt the crisp air fill my lungs more times than i can count :-) those were good days. i would have loved to have had your necklace warm around my neck each and every one of those days. what a gorgeous piece! it has a warmth and coolness all wrapped up in it. Gorgeous. Love your color palette. Feels just like a cold day with breath taking beauty that only winter can give. Super interpretation. All I could think about when I saw your inspiration pic and design was being wrapped up in a parka on a cold winter's day. I love your focal. Wow, I agree with Patti, even though I am in Florida, I still love looking at wintry scenes. I love the necklace. and your druzy and sari pick up the browns in the picture. Wonderful, wonderful! Great job!!!! I was taken with that design also and I love your take on it. The cream and the blue are just amazing together! The necklace is just gorgeous! An absolutely stunning necklace!! You've captured that photo to perfection! Karin, your necklace in gorgeous and captures the snowy crispness of the photo beautifully! I love how your focal bead reminds me of snow swirling around the ground! I'm so glad you were able to participate in the hop! Thank you! Love the photo you used as your inspiration and color palette. The focal you used is gorgeous and love how you incorporated fiber into your design. I love your beautifully bold design with hard and soft elements. A show stopper! SO pretty, Karin! I like how the fiber mimics the softness of the snow, while the focal and the stones echo the hardness of the rocks and ice. The focal is gorgeous! Your necklace is gorgeous! It is so like your inspiration photo the blue of the sky and water, the gold tan of the grass, the dark gray of the mountains. Great use of the technique! The necklace is the perfect colour for winter. Gorgeous necklace, and certainly evocative of that wintry landscape! nice job! Wow! You captured the colors of the image beautifully in your piece! I love it! That necklace is stunning! You've captured the colors perfectly and the composition looks amazing! LOVE! I like what you have done, but I am drooling over that lapis! Great necklace!